From family activities to adult-only celebrations, Memphis offers a great selection of New Year's Eve events to help you ring in 2019. The city hosts countdown parties, pre-fixe dinners, live entertainment, DJ dance parties, and of course, a ball drop. Make sure to plan your New Year's Eve events in advance, so you don't miss out on the party of the year! Trolley Stop Market will host their annual kid-friendly New Year's Resolution Party at the restaurant on December 31 from 5:30 p.m. to 9 p.m. Expect big-screen movies, arts and crafts, cookies, prize giveaways, and a balloon drop at 8:30 p.m.
Tickets are just $5 per kid, but you'll need to make a reservation by calling 901-526-1361 or emailing trolleystopmarket@live.com. 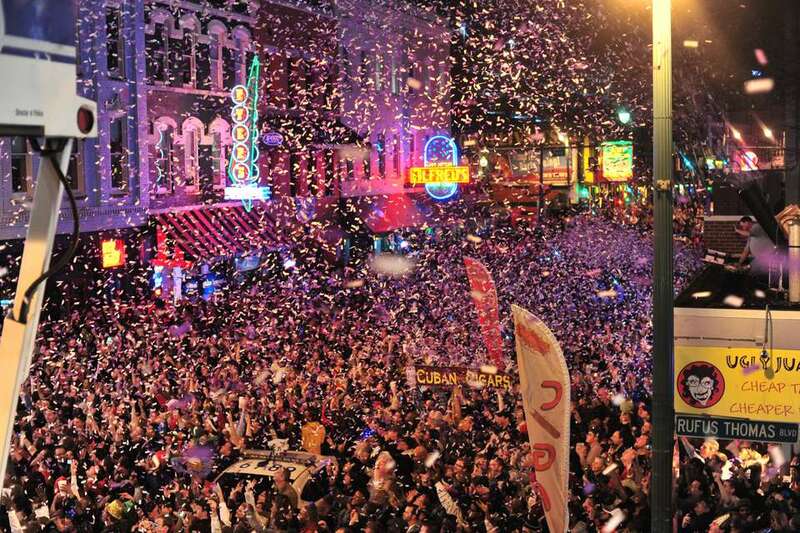 Make your countdown on Beale Street for the annual Hard Rock Guitar Drop at midnight at this huge New Year's Eve celebration. Party with tens of thousands of people, enjoy live music, purchase drinks, and watch the ten-foot-tall guitar "fall" to ring in 2019. On Beale Street itself, B.B. King's will have a stage set up at Fourth Street and Beale with live music starting at 8:45 p.m. There will be fireworks at midnight. The street is free to enter, but only for patrons 21 and up. Tickets for the Guitar Drop are $35 for general admission to the stage front area, and can be purchased through Hard Rock Cafe. Plenty of Memphis restaurants offer fine dining on New Year's EVe. They'll have prix fixe menus and require reservations. The luxe French restaurant Erling Jensen is a good option for New Year's, as is Iris and Fleming's Prime Steakhouse & Wine Bar. These romantic restaurants are perfect for any special occasion, including New Year's Eve. For a more relaxed dining experience, try the city's more casual New Year's Eve dinners and some of Memphis' favorite establishments. In addition to New Year's Eve brunch, Celtic Crossing will offer a four-course dinner, champagne toast, and live music. Meanwhile, Blind Bear Speakeasy on Main Street downtown will serve a three-course meal starting at 5 p.m. on New Year's Eve. Memphis is the music city—home of the blues and the birthplace of rock 'n' roll—so it's no surprise that so many of the New Year's Eve events revolve around great bands. Lafayette's Music Room is always busy on NYE (tickets get you community seating, passed appetizers, and a bubbly toast at midnight). Railgarten's free New Year's Eve event is also a hit, as is the live performances at Memphis Sounds Lounge, HiTone, and P&H Cafe. In past years, Young Avenue Deli has hosted Spaceface's laser rock show for New Year's Eve. It included 3d glasses and champagne. Details for 2019 have not been released yet. The Peabody hosts one of the biggest Memphis New Year's Eve parties every year, with multiple bands, a DJ, and a jazz trio in the lobby, mezzanine, and Corner Bar areas. Expect plenty of dancing, drinks, and more. VIP tickets include some drinks and appetizers. Tickets are $50 for general admission and $150 for VIP. In addition in individual events inside Overton's various bars and restaurants (like Lafayette's and The Second Line) the entertainment district itself will host a NYE Party in the Tower Courtyard. The lineup hasn't been announced yet, but in past years it has included artists such as The Dantones and DJ Bobby Smith with actress and musician Alexis Grace hosting.